Andrea grew up as a ballet dancer, which led to a life long pursuit of movement involving everything from running to yoga, fitness training to pilates. After having a baby, she came to find Pilates to help get her body back and simply fell in love with the method all over again. She likes to think of the body as having the capacity to contain, not just a book, but a “library of movement” vocabulary and strives to allow all her clients to feel autonomous and curious in their practice. To then be able to approach daily life with confidence and courage and freedom from physical constraints, that’s the peace of mind that comes with a mindful pilates practice. With a keen eye for efficient movement and alignment, she strives for gentle precision. And with a firm nod to humility and enjoyment, she hopes to send you out with a smile. Stronger, longer, and ready for the day. 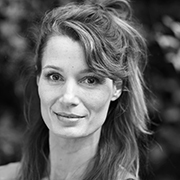 Andrea is certified in the Polestar Pilates Mat Course (2015) and is currently finishing off the Polestar Pilates Comprehensive Course (2018). She is also a certified Barre Concept trainer (2018) She is available as a trainee at Studio Anna Mora as part of her study.